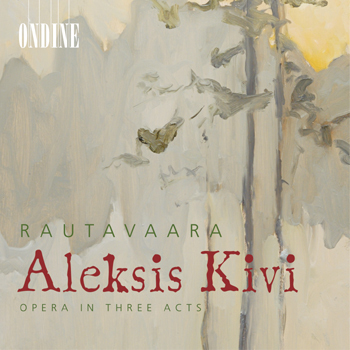 This double CD contains the three-act opera Alexis Kivi by Finnish composer Einojuhani Rautavaara who also wrote the libretto. It tells the story of the Finnish national author Aleksis Kivi (1834-1872) who wrote the first significant novel in the Finnish language, Seven Brothers (Finnish title: Seitsemän veljestä; completed in 1873 and translated into more than thirty languages). Rautavaara wrote the opera from 1995-1996 for the Savonlinna Opera Festival. The commission was instigated by Jorma Hynninen, who had been instrumental in the genesis of Thomas and Vincent too. He also created the title roles in all three operas. Aleksis Kivi was premiered in the rock cavern concert hall at Retretti Art Centre near Savonlinna on the occasion of the 125th anniversary of the death of Aleksis Kivi in 1997. This recording was made five years later, in April 2002, at the Suolahti Hall in Lahti.